Kevin Evans is willing to invest in a quality mineral program. With years of his own research and first-hand results, he knows that the investment pays dividends in a healthy herd and calves that gain. Evans manages nearly 1,400 commercial cows at Thaler Land & Livestock in Southeast Wyoming near LaGrange, with his father-in-law, Dennis Thaler. In addition to those cows, they background 1,000 head of calves each year, and labor is limited to them and three hired men. With minimal labor for so many cattle spread across more than a 35-mile span, Evans takes the initiative to provide his calves a sound nutrition program as soon as they are weaned. When they are received at the backgrounding lot, he provides them all with Vita Charge® Cattle Drench. Then, he puts out Vita Charge Stress Tubs with MOS for the first 3-4 weeks that the calves are weaned. Evans typically will put out four 200-pound tubs per 200 head of calves. In addition to the drench and tubs, that both contain Amaferm®, a natural prebiotic designed to maximize the nutritional value of feed, Evans feeds Head Start, a pellet made by CHS that he also requests Amaferm be added to. “The Amaferm helps keep everything healthy, plus we get good gains off of it. Any time we don’t have to pull sick cattle, and we don’t have to put antibiotics in them, it is definitely cost effective,” he said. 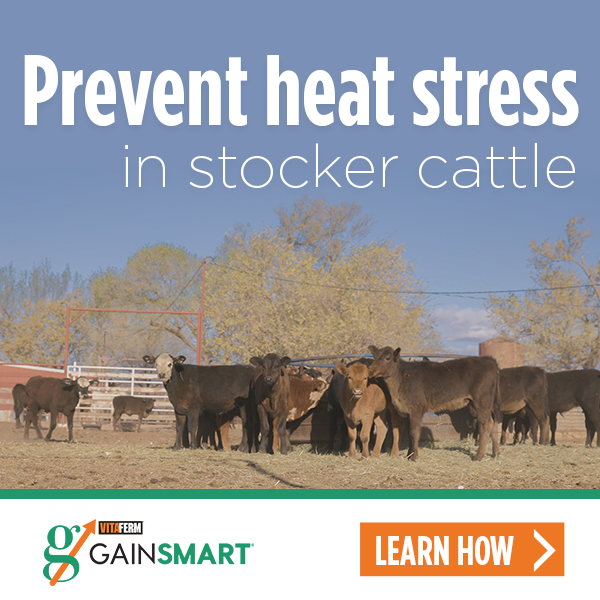 With primarily two employees responsible for all the feedlot cattle and watching their health, it is vital to keep cattle healthy – both in the backgrounding operation and with the cow herd. Last year, from October to February, Evans said of the 1,000 head in the feedlot, they only doctored around 25 head. Their investment in keeping the calves healthy not only saves on labor, but also the expenses of fuel for their pickup, antibiotics for treatment, treatment and recovery time and lost performance. “That was my target for using the product. My goal is if I can feed them, and I don’t have to doctor them, I’d rather do that because it does take a lot of labor to doctor calves. We are really just a cow ranch. We don’t have any horses on the place, so roping and doctoring calves is a little tougher on us,” Evans said. Keeping his calves healthy is definitely a part of the Amaferm advantage, but Evans says another benefit is their performance. He sees an average daily gain of 3-4 pounds per calf, per day while they are in the feedlot. He says healthy calves are growing calves, and it all relates back to having a healthy gut. He also says Amaferm helps shorten the recovery of any calves they do have to treat. Being proactive and making an investment in his animals’ health has saved Evans time, money and labor. The Amaferm advantage helps his calves stay healthy and gain, and that is an investment worth making.